It used to be that mentors and mentees could set aside their work for regularly scheduled mentoring meetings. But given the time demands that most of us face, scheduling such "extracurricular" time has become tough - or just plain impossible. Today's mentors need to take advantage of everyday work situations as opportunities to mentor. Mentoring in the Moment addresses this modern trend by providing a framework that mentors can use to identify and respond to mentoring opportunities. This 20-item instrument describes mentoring as a journey with specific phases that unfold over time, each requiring a different type of mentoring behavior. The art of mentoring "in the moment" lies in accurately gauging where mentees are in their developmental journey, and then altering your responses accordingly. I - Identification: Idealizing the mentor and asking for guidance. II - Growth: Sensing strengths and experimenting with behaviors. III - Separation: Wanting an independent identity. IV - Mutuality: Seeking and sharing experiences as an equal. Understand the four phases of the mentoring journey. Measure their effectiveness as a mentor in each of the four phases. Discover three types of mentoring responses. Learn how to recognize and respond to a mentee's specific developmental signals. The business pages of the world’s newspapers are filled with stories about managers and executives who suddenly self destruct. Individuals who were once considered to be successful ultimately fail, either ending up in a dead-end career or let go by their once seemingly loyal organization. This phenomenon is called Derailment. Just as a train falls off of its tracks, this breakdown is never intentional, and it almost always causes considerable damage. The good news is that derailment can be predicted – and even prevented – when managers are given the right resources. The Leadership Unlimited Profile is a new assessment that helps managers to develop the behaviors that will help to ensure their success. Based on more than 20 years of research, it provides specific, targeted feedback on those behaviors that severely limit effectiveness, including: Organizing Behavior, Relationship Behavior, Learning Initiatives Behavior, Emotional Behavior, Career Management Behavior. The assessment serves as an “early warning” tool by providing quick insights into the critical areas of performance, identifies the skills sets needed to reach the next level, and establishes benchmarks to help people take charge of their development. 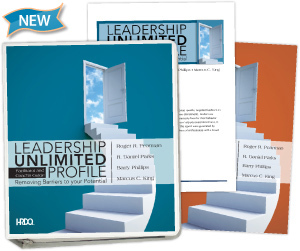 The Leadership Unlimited Profile is an online self assessment that takes approximately 30 minutes to complete. Leaders respond to 90 different items that address the five scales and 12 domains that make up the Profile. If you are planning to use the assessment for classroom training, we recommend you allow approximately 1 – 1 ½ hours for interpretation of scores, debrief, and action planning. The Leadership Unlimited Profile also includes a step-by-step training outline for a one-day workshop.